A small but intriguing discovery during the restoration has been the sight of a British Standard ‘Kitemark’ found on the rear wheels. The recognised symbol that something is ‘up to standard’ has existed since the beginning of the twentieth century. On 22 January 1901, Sir John Wolfe-Barry, who designed London’s Tower Bridge, persuaded the Council of the Institution of Civil Engineers to form a committee to discuss standardising iron and steel sections. This led to the creation of the British Standard Mark in 1903, which later become known as the Kitemark. Today it can be seen displayed on a variety of products, traditionally those which require a high level of safety. 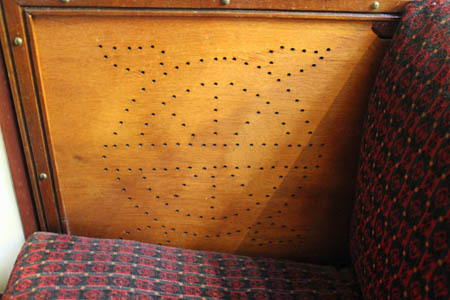 Tramway rails were the first item to be standardised, with the introduction of the Kitemark reducing the number of Tramway gauges from 75 to 5. 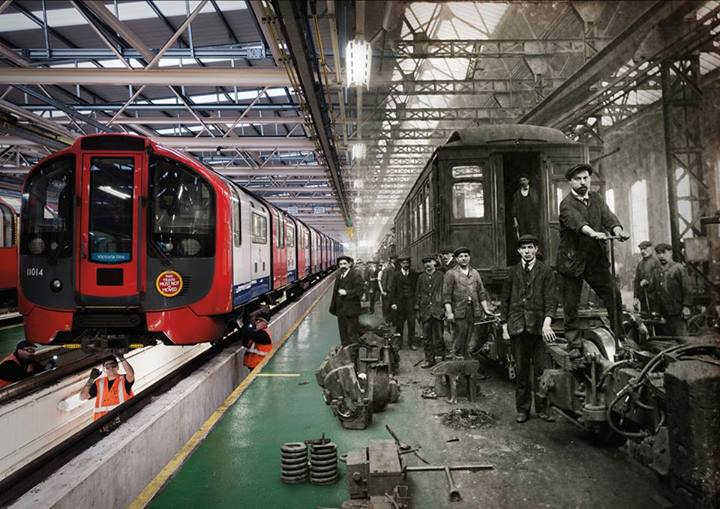 From April 1929, the British Engineering Standards Association was granted a royal charter. 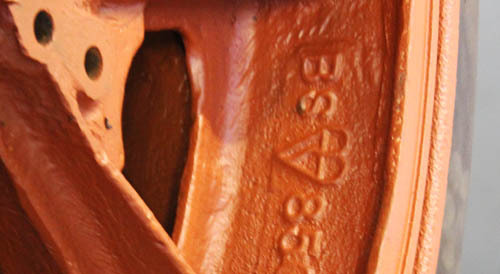 The Kitemark on our B-type suggests the sort of quality that led to its reputation for reliability. It would have certified the construction methods and materials necessary to build a safe and effective wheel. Unfortunately, after further research we have been unable to locate the record for BS850 in the British Standards Institution archive. 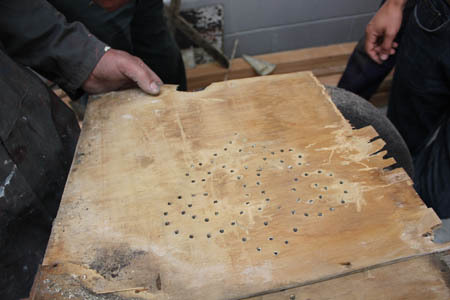 It possible that being such an early Kitemark, the record was simply lost as the technology evolved or became redundant. It is worth noting wheels with solid rubber tyres had almost completely vanished by the early 1930s whilst the only record found relating to BS number BS850 dates from 1939, and is completely unrelated to tyres. 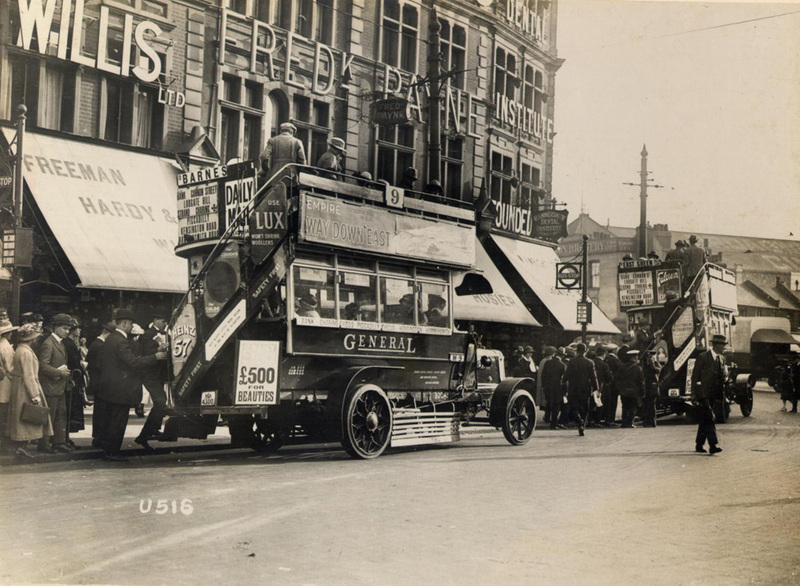 Employees of the London General Omnibus Company were constantly advised to put ‘Safety First’ and the doctrine ran through to the design and construction of the vehicles used by the company. This small but important sign acknowledges this early emphasis on safety in transport. 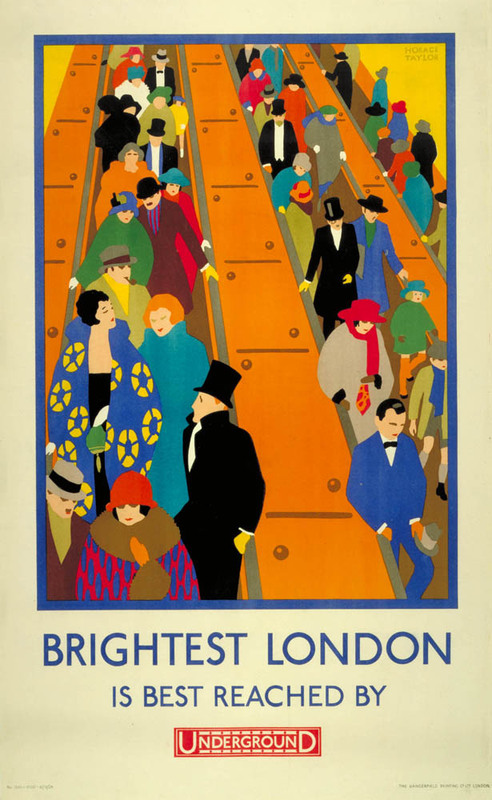 The results are in and the public have decided that the best London Underground poster of all time is Brightest London is best reached by Underground, designed by Horace Taylor in 1924. Over 42,000 people voted in the Siemens Poster Vote, choosing from 150 posters that featured in our exhibition Poster Art 150 – London Underground’s Greatest Designs. Brightest London drew 1752 of the votes with London Zoo by Abram Games (1976) and Underground – the way for all by Alfred France (1911) – securing 1614 and 1342 votes respectively. The winning poster was created when cinemas still showed black and white films; vibrant posters like this splashed colour into 1920s London. 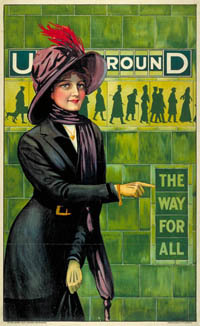 The Underground is presented as bright, popular and extremely fashionable with a very smart crowd heading out for a night on the town. Still vibrant almost 90 years after it first brightened Underground stations, it is easy to imagine how effective it must have been at the time. The artist’s granddaughter once explained that Taylor often liked to paint himself into his posters. In this one he is the gentleman with the top hat and the beard on the middle escalator. The Poster Art 150 exhibition opened on 15 February 2013 and was due to close in October but was extended until 5 January 2014 due to popular demand. 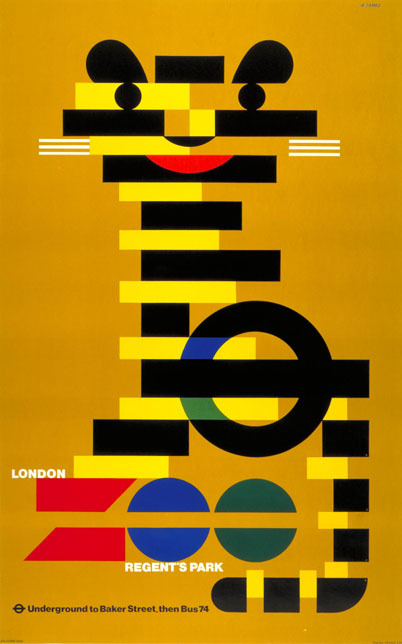 It formed part of the 150th anniversary of the London Underground celebrations and featured posters by many famous artists including Edward McKnight Kauffer, Man Ray and Paul Nash, and designs from each decade over the last 100 years. Information about some of the posters featured in the exhibition can be found on this blog. The posters were selected from the Museum’s archive of over 3,300 Underground posters by a panel of experts; the 150 that appeared in the exhibition show the range and depth of the Museum’s collection. As part of the exhibition, the Siemens Poster Vote seeks to find out what your favourite poster is. There’s now only a few days left to see our Poster Art 150 exhibition – so come along before 5 January and don’tforget to vote for your favourite! 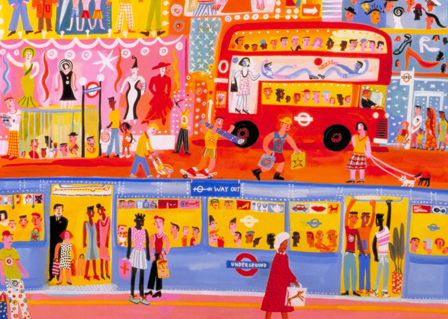 This poster is one of six designed as a series to promote London Transport Museum’s fantastic exhibition, Poster Art 150 exhibition – London Underground’s Greatest Designs, a key part of the celebrations marking the 150th anniversary of the world’s first Underground railway. Each poster comprises ‘teaser’ elements of some of the poster designs to be found in the exhibition. To help bring more clarity to the selection of images, the exhibition has six themes, Finding The Way, Capital Culture, Away From It All, Keeps London Going, Love Your City, and this poster depicting my favourite exhibition grouping, Brightest London. The poster has been very cleverly designed by the Museum’s Head of Design, Sau-Fun Mo, and fully represents the largely Art Deco flavour of this exhibition theme, without giving any substantive view of the posters on display. 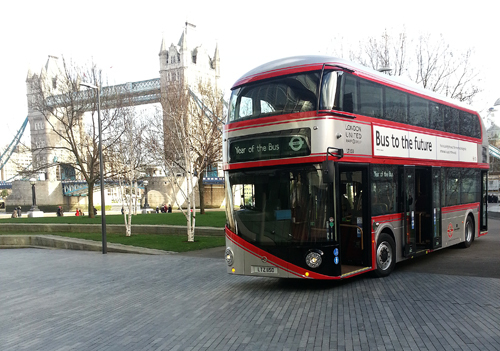 Highly colourful, it attracts attention and subliminally invites people to visit. As is often the case with such intelligently designed posters, the image has been a commercial success; Poster art can still attract great attention as well as function as exemplary marketing. Long may this survive.,. This poster and the other five in the series can be purchased at our Covent Garden shop and also online – along with other exhibition themed gifts. There are only a couple of days left to see the Poster Art 150 exhibition as the last day is Sunday 5 January 2014. You can vote for your favourite in the Siemen’s Poster Vote until midnight the same day. We’ll be announcing the winning poster the following week.